Many common questions can be answered by the semperThree faq and we encourage our readers to check here first before writing us with your questions. If you don't see the info. you need here, please check out our Contact Us page and drop us a line. Who are you people? ; Are you Sony-affiliated or licensed? How do I set up a sharegroup? Why is PS2 compatibility no longer available? How can I get PS2 compatibility in my PS3? Why can new PS3s play PS1 games, but not PS2? My PS3 is showing a yellow LED light and powering back off. Is this repairable? Can you work on / repair my PS3 for me? What sort of repairs are safe to do myself? Which ones require professional service? How do I upgrade my Hard Drive? Where can I find replacement parts? Are there retailers you recommend? What does this or that error code mean? Can I copy games to my PS3 hard drive and play them without the disc? 1.Who are you people? Are you Sony-affiliated or licensed? We have no ties to the Sony corporation whatsoever; we're just tremendous fanboys. For more information, check out our ABOUT page. 2.How do I set up a sharegroup? Sharegrouping is a subject you won't generally find on semperThree, but we will at least explain why. Sharegrouping, in brief, is based on PSN's lenient rules regarding up to five system activations for content. The intent of those policies is that a single household can have multiple PS3 consoles and share downloaded games and content without multiple purchases. Sharegrouping takes advantage of this system for multiple people. We won't discuss it any further than this summary on the simple grounds that this is an abuse of a fairly generous policy. Sony's five-activation policy is incredibly user-friendly. Compare it to the Xbox 360's methods; if your 360 breaks down and you have to attach your old hard drive to a new console, you require a constant connection to Xbox Live to use any previously purchased content. Sony gives a lot of leeway for users that migrate to other systems or own multiple consoles, and sharegrouping is an abuse of this freedom. As multiple-system owners ourselves, this has benefited us well in our households. We don't advocate abuse of this policy for fear that Sony would be forced to restrict it or remove it entirely. For this reason, we don't recommend sharegrouping. If you intend to do so, there is plenty of information available online. 3.Why is PS2 compatibility no longer available? 4.How can I get PS2 compatibility in my PS3? 5.Why can new PS3s play PS1 games, but not PS2? All three of these questions are closely related and share largely the same answer; the PS2 used a unique chipset that can't be emulated easily, and removing that chipset made the PS3 much less expensive for them and for consumers. Full PS2 compatibility requires two chips from the original system; the “Emotion Engine” CPU and the “Graphics Synthesizer” GPU. The original 20gb and 60gb consoles had both, thus 100% compatibility. The first 80gb consoles had the more expensive of the two chips, the Emotion Engine, removed. It ran PS2 games using the Graphics Synthesizer and software-driven emulation. It had approximately 80% compatibility, but still lacked the reliability of the original models. Rather than continue putting expenses towards sub-par compatibility, Sony made the decision to remove it entirely. The first non-backwards-compatible unit, the 40gb, was a full $100 less than the PS2-compatible models. A large part of the PS3's price slide from $600 at launch to under $300 today was removal of these parts. Backwards-compatible systems were more expensive to make and sell, and cutting the feature made them more affordable for all of us. A PS3 that isn't compatible already cannot be changed; it lacks the parts to play PS2 games. PS1 consoles used simple architecture and somewhat off-the-shelf parts. It is not difficult to run PS1 games on any computer or game console now because the machine is so simple by comparison. The PS2 required a unique chipset; the PS1 was much less complicated. 6.My PS3 is showing a yellow LED light and powering back off. Is this repairable? Though this is covered in more detail in our REPAIR section, it is an important question to address. The 'Yellow Light of Death' hardware failure is just that; a failure of hardware, not settings or software. Though not a common issue by any means, it is the most difficult regular issue to deal with. If your PS3 still has the warranty seals on it, we recommend going straight to Sony for YLOD problems. Even if it's not still under warranty, the fees they might charge are still less than buying a whole new system. Attempting to repair it yourself will void your warranty and Sony will not take the console in for repair once you have opened it. If you are still interested in the specifics of the YLOD error and methods of repairing it, full details are available in the REPAIR page. 7.Can you work on / repair my PS3 for me? This unfortunately isn't a service we offer at this time. We are considering doing hands-on work and services through this site, but it simply isn't feasible for us at this time. Stay tuned for further updates. 8.What sort of repairs are safe to do myself? Which ones require professional service? 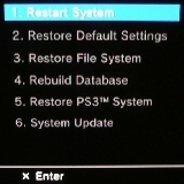 So long as you have access to the parts and a good background in electronics and computer hardware, most PS3 repair should be safely within your reach. On average, though, some services are riskier than others. Regular maintenance or simple part-swaps should be safe for anyone to do at home. These may include; Upgrading Hard Drive - Replacing Blu-ray Drive - Cleaning/Dusting Internals. Servicing more complex parts, or altering parts beyond their stock features can be much more challenging. Examples are; Replacing, Adding, or Modifying USB ports – Replacing or Modifying Cooling Components. Difficult hardware fixes or extensive system alteration can be complicated and risky. We don't recommend these projects unless you have extensive experience in computer repair or building. In particular, this would apply to; YLOD (Yellow Light of Death) Repairs – Custom Cases or Rebuilds. In the end, only you can judge your own aptitude for this sort of work. If you're here, you probably already have a good familiarity with computer hardware and should have no trouble whatsoever with a simple hard drive swap. If you see a process or service that seems confusing, don't risk your hardware. Find a professional. Likewise, even if you are experienced and confident in a process, back up your data, and update backups often. 9.How do I upgrade my Hard Drive? This is a quick, simple upgrade that is fully within warranty to undertake. Full details are available on the REPAIRS page. 10.Where can I find replacement parts? Are there retailers you recommend? We've gotten parts from a number of online sources over the years- some great, some not so much. We are currently in the process of selecting ideal retailers that we can comfortably recommend to readers on a regular basis. Check back for updates. 11.What does this or that error code mean? Though we have not confirmed all errors for the PS3, We have compiled an error code list to make sense of as many system messages as possible. The list is in our TROUBLESHOOTING section. 12.Can I copy games to my PS3 hard drive and play them without the disc? We do not endorse or condone piracy of retail software. There are no current methods of doing so, nor do we desire any. We fully believe in the end-user's right to use and modify their purchased hardware as they see fit, but those rights end where stealing begins. The abundance of piracy out there already is what keeps game prices so steep and DRM methods so hateful. With the way game piracy drove the Dreamcast out of the market, we'd rather not see it catch up to the PS3.